A wine like today's gem from Eric Texier in the Rhône Valley can only be filed under the category "what's not to love?!?" 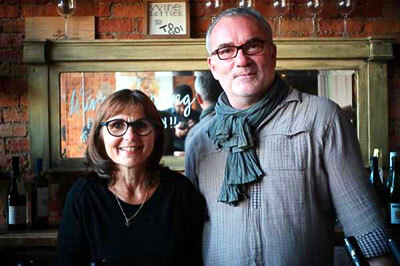 and that's coming from two wine professionals who are inundated with new wine samples on a weekly basis. Before we launch into the wine we're going to go a bit off track with a simple recipe. You'll see why in a minute. One of our favorite dishes to make at home is duck confit. Kevin cooks duck legs slowly in the sous vide machine so they are meltingly soft and tender. He then crisps the skin to perfection in a matter of minutes. We then serve the duck confit with crispy duck fat roasted potatoes and a fruit-forward red currant sauce. Talk about a fast, easy and delicious meal. For years we've been searching for the perfect wine to make this red currant sauce and today we finally found the winner! Eric Texier's Chat Fou!!! Combine ¼ bottle of Chat Fou (or other fruit forward red wine), ½ bottle of Crosse and Blackwell's red currant jelly, a smashed clove of garlic, a handful of fresh thyme and some salt and cook it down until it coats the back of a spoon and then strain it. That's it. The wine is the key to this absolutely delicious sauce and it's never been better than with Chat Fou! Now back to the wine. It's not just about the sauce! 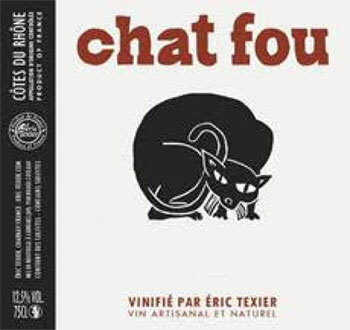 Chat Fou is an unusual blend of 85% Grenache and 15% white grapes which can include Clairette, Viognier and other grapes. Some of you may know that blending white grapes with the red grape Syrah in the Northern Rhône Valley of France can occur in Côte Rôtie. It is not common in the Southern Rhône Valley, so there we have the first surprise. Aside from the fact that this wine is a blend of red and white grapes, it's also unusual in that the grape varieties are co-harvested and co-fermented in whole clusters (much like Cru Beaujolais) which gives it a softness and roundness you wouldn't normally expect. The organically grown grapes are then gently pressed and fermented in concrete tanks, as well as aged in concrete tanks. You won't find any filtration of fining here. So, what's all this mean in practical terms? And now for the bad news (sorry!). Since we received our initial shipment of Chat Fou, elite wine buyers across the state went berserk for it, so much so that the wholesaler had to allocate the wine to just 20 buyers in Massachusetts. That means we have a TINY amount of this wine in stock so we have to limit this offer to 2 bottles per client only until it runs out. We thought about taking it home and squirreling it away because we just LOVE this wine, but that wouldn't be fair and we really want to share this gem, even if you can only purchase two bottles. $17.99/bottle, limit two bottles per customer. 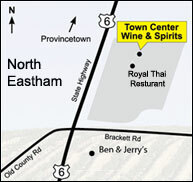 If purchased as part of a mixed case of wine the bottle price comes down to just $14.39/bottle. We expect this wine to sell out within hours, so please press reply to this email or call the store as soon as possible to get in on this offer.